Henry P. Glass, Swing-Line Toy Chest, 1952. Lacquered Masonite and birch; 31 3/4 × 33 × 17 1/2 in. Manufactured by Fleetwood Furniture Company. Milwaukee Art Museum: Purchase with funds from the Demmer Charitable Trust, M2015.85a,b. 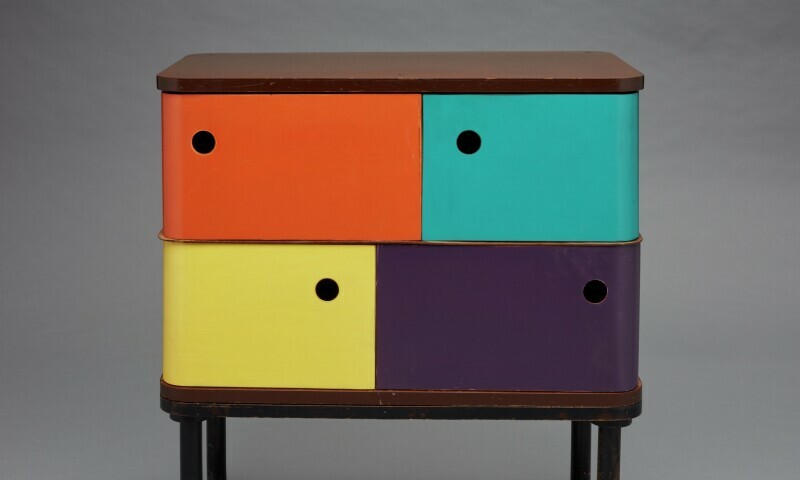 Serious Play: Design in Midcentury America presents the concept of playfulness in postwar American design as a catalyst for creativity and innovation. This exhibition will explore how employing playfulness allowed designers to bring fresh ideas to the American home, children’s toys and play spaces, and corporate identities. During the 1950s and ’60s, diverse materials and manufacturing techniques opened up possibilities for new approaches to design and larger-scale production. Larger disposable income and leisure time of a growing middle class offered more possibilities for designers to help Americans discover a new way of living at home through thoughtfully designed objects. An emerging focus on child development prompted an interest in children’s furniture and placed a fresh emphasis on the importance of smart toy design. Pervasive Cold War anxiety created a desire to bring positivity and escapism into everyday spaces. Co-organized by the Denver Art Museum and the Milwaukee Art Museum, the exhibition includes over 200 works in various media, ranging from works on paper, models, textiles, furniture and ceramics to films, toys, playground equipment and product design. Organized around three themes—the American home, child’s play and corporate approaches to design—Serious Play encourages visitors to consider how design connects to their daily lives.